Seriously now, what are Lambeth Council’s plans? I’m not joking here, I want some answers. Recently my own dear council, Lambeth, voted through a “momentous document” which has already been praised as “terrific” by Andrew Gilligan and “fantastic” by the Lambeth Cyclists. But walking and cycling have been the high priority for Lambeth Council for AT LEAST 11 YEARS, yet the streets remain curiously car-centric! Surely this terrific and fantastic document won’t turn out to be nothing more than wasted ink? So I pointed Lambeth Council to my last post which gives an example of the sort of thing they need to be looking at if they’re planning on being true to their word. 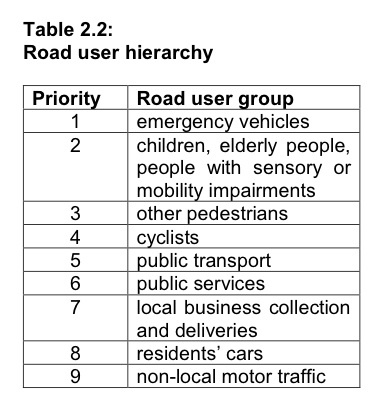 Lambeth Council’s ‘Road User Hierarchy’ in 2002. With the possible exception of emergency vehicles, this entire list is an inversion of reality in Lambeth, and I have the concrete and asphalt to prove it. The council, minds on other more important matters, failed to respond but I did get two replies. So Lambeth Cyclists are offering a vague and distant scheme from TfL as evidence that Lambeth Council takes its goals seriously? Maybe whoever sent that tweet would be better off moving to Crapburgh, they’d fit right in there. So, what concrete changes have Lambeth Council promised so far? What plans are they consulting on which prioritise walking and cycling and push private cars to the bottom of the transport pile? I genuinely want to see them. I really want this to happen. But I suspect that it won’t. Will Lambeth Council make me happy and prove me wrong, or will they just offer me a free cargo-bike trial instead? What changes will Transport for London make at the Aldgate East junction, where Philippine De Gerin-Ricard was killed just over one week ago? 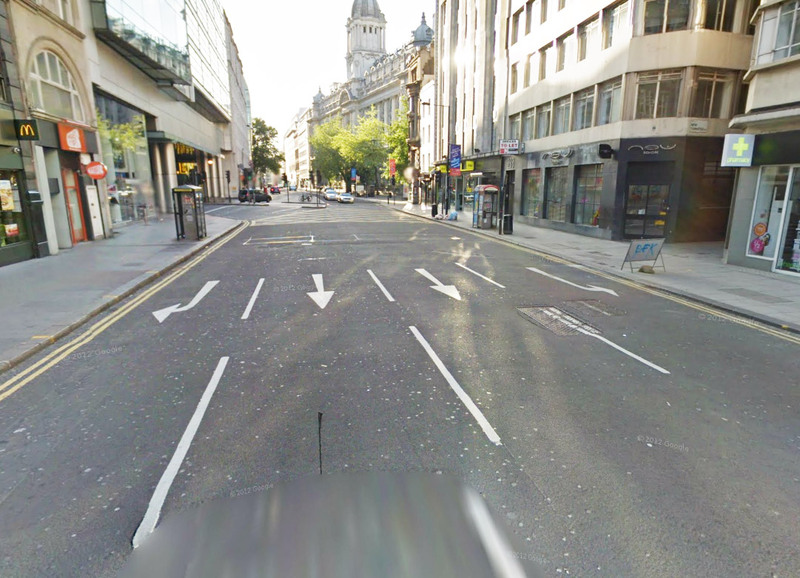 What changes will be made at Holborn, where another person was killed by a lorry today? They’ve tried “encouraging” cycling, they’ve tried ignoring it, they’ve tried propaganda, they’ve even tried lying to us about it. They’ve tried doing tiny bits of good stuff, they’ve tried doing long stretches of crap stuff, they’ve tried fiddly back streets many many times (though they never really got even that right, so are determined to give that failed concept yet another go anyway). What else can they try? Surely TfL have exhausted the list of things which may or may not make cycling safe and attractive. They’ve certainly exhausted the list of cheap, ineffective and motor traffic-neutral interventions. There’s only one thing left to do: Bite the bullet and do what the Dutch did. Boris Johnson was re-elected as Mayor over one year ago now and has been the “cycling Mayor” for five years, yet progress has been glacial over this time. Is London significantly better for cycling than it was five years ago? The appointment of Andrew Gilligan as part-time Cycling Commissioner has moved things on a bit, as he seems to be eager to do good things and prevent bad things from happening. But despite all the fine words, there have still been few firm plans, let alone any concrete changes on the ground (though the CS2 extension was due to be started a few weeks ago, I don’t know if it has yet). I’d settle for some plastic changes – and by that I mean trials of new road layouts. One of the many things Andrew Gilligan said at the LCC seminar in April (three months ago already!) was that he’d like to trial removing a lane here, adding a cycle track there, by using temporary measures. I’d really like to see this happen now. Set up some bollards and some temporary lights, let’s see how a separate green phase for bikes affects things. We’ll almost certainly discover that it works just fine, as Leicester did. All hail the Mayor (of Leicester)! Earlier this year, Leicester Mayor Sir Peter Soulsby closed one lane of Newarke Street to see what effect it would have on congestion. (See local news articles before, at the start, during, and after the experiment.) Despite Newarke Street being a busy thoroughfare and part of the city’s inner ring road, the council wanted to see if some of the three-lane one-way carriageway could be reclaimed for walking and cycling. After a four-month trial, they concluded that the road worked just fine with two lanes, and the extra lane will be used to extend the footpath and install “a separate cycle lane, surfaced in red asphalt” – aah, bliss! I can’t wait to see it (don’t mess this up, Leicester!). So that’s how easy it is. But you know what? I reckon Leicester could have gone one step further and instead of coning off the lane to all vehicles they could have created a temporary cycle path to see whether more people chose to cycle along there when protected from motor traffic. Sturdy plastic and concrete barriers are available, which would remove the risk of a motor vehicle driver careering through a row of flimsy cones. Is there really no room for a cycle path here? Is there really nothing that can be done? Nothing that can be tried? Just fast-moving heavy vehicles day after day, killing some by force and killing thousands by suffocation and fear. Andrew Gilligan recently told us that we can’t expect change overnight. In his case I guess that’s fair enough, it’s a part-time position and he’s only been in the job a few months. Boris and TfL: it’s time to stop talking and start taking space from our bloated roads, because without doing that London will remain a dangerous smog-filled mess. Update: Of course, it’s not just TfL who need to up their game, but the local London councils too. Most roads (even a large chunk of the ‘main’ roads) are controlled by the councils, not TfL. So this post is really aimed at them too, just as much.